Alga is a Nord bard living in Bruma with her "live-in" partner, Honmund. She offers basic training in Speechcraft. Alga doesn't believe in all that "chapel wedding nonsense" and takes pride in living her relationship the old Nord way. She is perfectly happy being Honmund's "woman" and takes it easy in life: she wakes up every day at 6am and wanders around her house until midday. At that time, she heads to Olav's Tap and Tack, where she spends two hours enjoying red wine and good company. After that, she heads back to the house for some more wandering until 6pm, when she once again heads to Olav's to eat her dinner. After two hours, she heads back to the house and spends the rest of the evening there until going to sleep at midnight. At any time when not eating or sleeping she may decide to take a trip to Novaroma or Nord Winds or just stand around outside Arnora's house. The other exception occurs when Martin leads the allied Army out to the Defense of Bruma, when she is one of the citizens who cheers as he leaves. Her clothing is a typical upper-class affair: a green brocade doublet, green silk garment, and a pair of velvet shoes. She carries the key to Honmund's house and a small amount of gold. Alga has the ability to use a leveled set of bard spells. When you meet her for the first time, she will introduce herself and explain her beliefs: "I'm Alga. I'm a Bard and a Speechcraft trainer. Honmund is my "live-in" partner. No offense, but I don't want to hear any 'Mara Mother Mild' and Chapel family business. Honmund and I live together in the old Nord way. Good enough for my Fa and Ma, and good enough for me." Her "live-in" partner agrees, and announces: "I'm Honmund. I'm a prospector. Alga's my woman. Nord-style. None of that Chapel wedding nonsense." 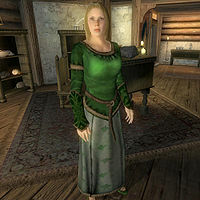 When asked about Bruma, she will tell you: "Bruma's a funny place... half Cyrodiil and half Skyrim. I'm old Nord all the way. I keep the old songs and stories alive." "Alga has a lot of good tales to tell. I wish I could tell a story like she does." "Alga sure can tell a good story. I'm not normally a big fan of bard's tales, but she's got some good ones." "Have you ever heard Alga tell her tales?" "Isn't Alga a good storyteller?" "I've heard many of Alga's stories. She's got a real gift for telling a tale." "She's the best bard I've ever met. Of course, being a bard is almost as bad as being a pilgrim. There's no future in it." "Much as I dislike bards, I wouldn't mind learning a thing or two from her." "She can spin a yarn, that's for sure." Alga is one of the few named NPCs in the game who will respawn if killed, which is somewhat unusual given that she has no importance in any quest. Esta página foi modificada pela última vez à(s) 22h55min de 27 de abril de 2013.